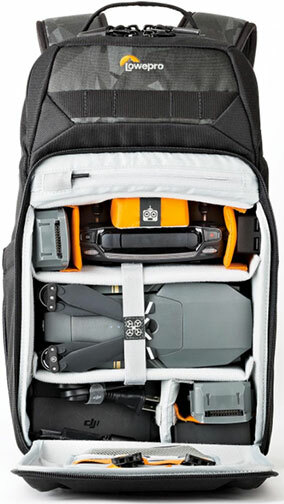 Petaluma, CA—Lowepro launched the newest addition to its DroneGuard series of carry gear: the DroneGuard Pro Inspired. The new pack expands Lowepro’s choices for consumer drone protection. 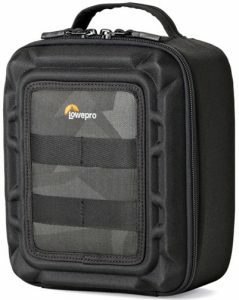 In addition to the new DroneGuard Pro Inspired, Lowepro expanded the DroneGuard family to include five new DroneGuard packs and cases. Designed specifically to protect DJI Inspire I or Inspire II drones, the DroneGuard Pro Inspired features a top-loading hangar compartment. The lightweight pack has a unique carry system to increase maneuverability and function like a backcountry backpack. 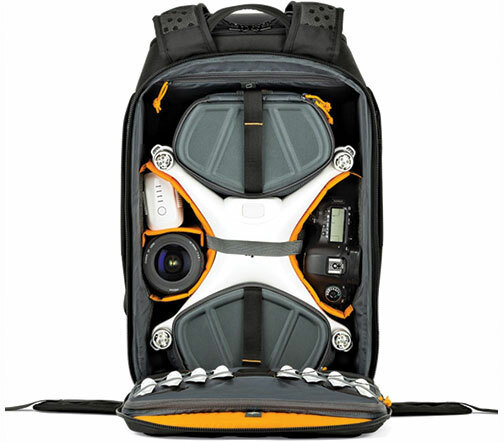 Flexible dividers house a DJI Inspire or Inspire II, a transmitter, up to six extra batteries, a mini tablet protected by Lowepro’s built-in CradleFit technology, and other essentials. Exterior neoprene motor socks give added protection, along with compression-molded FormShell technology to protect gear and props. In addition, adjustable shoulder, chest and waist straps are designed to keep users comfortable. Also, the company’s ActivZone balanced comfort system is engineered to deliver ergonomic support and ventilation. ather AW cover. 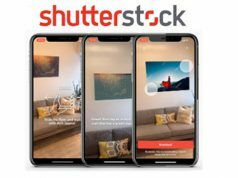 It has a suggested retail price (SRP) of $199.95. The expanded DroneGuard series also features other news additions. The packs, including the DroneGuard Inspired, all use compression-molded FormShell technology to protect gear without added bulk or weight. Packs with FormShell exterior pockets provide access to sunglasses, water bottles and other small items in addition to stretch and zipper side pockets for more accessibility to small items. 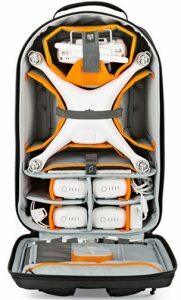 Built for the pro pilot, this professional-quality, lightweight backpack is designed to provide streamlined security under extreme conditions for a DJI Phantom, a transmitter, up to five extra batteries, a 15-inch laptop and a mini tablet. 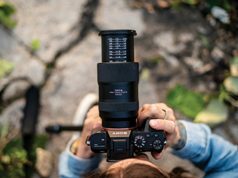 It also offers additional space for an Osmo and one or two GoPro action cams or a mirrorless camera kit and personal items. 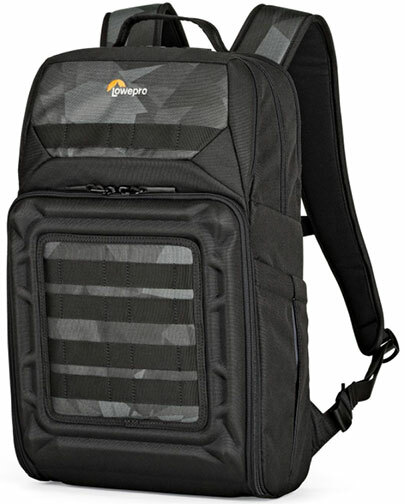 The pack features FormShell soft armor throughout for protection, with zippered access and customizable compartments to organize, carry and protect specific gear. Exterior attachment points provide extra storage, along with dedicated prop storage and removable transmitter and battery boxes to protect fragile parts. It also has a built-in AW cover. SRP: $274.95. Built to trek to any location, this specialized backpack is engineered to defend its contents against bumps and hard hits. 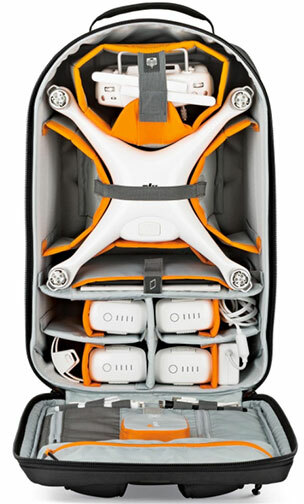 There are dedicated compartments for a DJI Phantom, propellers and a transmitter. 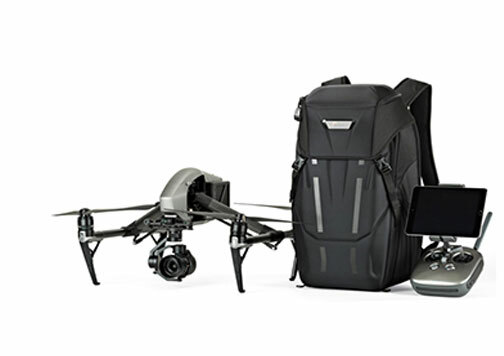 Moreover 15-inch laptop and 10-inch tablet pouches allow drone photographers to edit photos and footage on-location. The lightweight, armored pack also provides customizable organization for drone, propellers, its transmitter as well as tools. 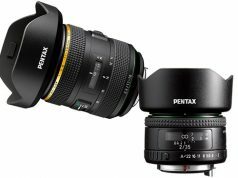 SRP: $149.95. This specialized backpack offers protection through a compression-molded FormShell soft armor exterior and flexible interior dividers. It fits a DJI Mavic Pro, a transmitter and up to five extra batteries. 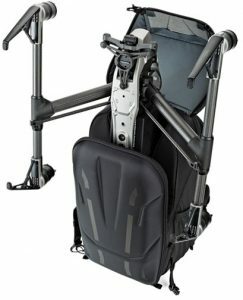 In addition, it houses a 15-inch laptop, a 10-inch tablet, the Osmo gimbal and two GoPros or a mirrorless kit, plus personal items. Also featured is a PhoneZone pocket on the shoulder strap for up to plus-size smartphones, extra storage and a transmitter pad to protect delicate control knobs during transit. SRP: $149.95. 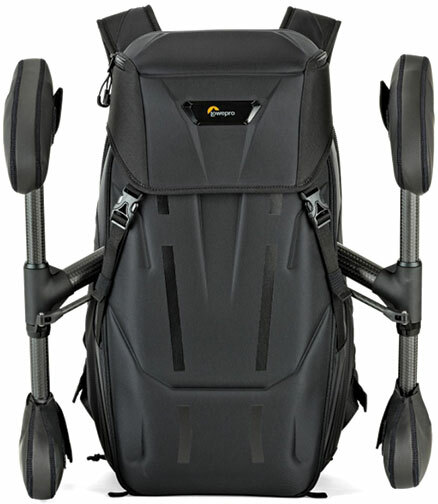 Created to house a DJI Mavic Pro and a hydration reservoir for water bottles, this streamlined backpack keeps drone enthusiasts’ thirst quenched and their devices safe while on the move. Geared for biking, snow sports, hiking and also climbing, the pack features flexible dividers to house the drone, a transmitter, up to five extra batteries, a mini tablet, snacks and an extra layer of clothing. SRP: $109.95. This case is designed to transport a DJI Mavic Pro as well as accessories. The lightweight bag offers protection without added bulk. It has adjustable dividers specifically to house the DJI Mavic Pro, a transmitter and an extra battery.